Sikkim has joined the nation and other parts of the world on the 4th International Yoga Day on Thursday. This year’s theme was “Yoga for Peace”. The day was observed at different levels by schools and different government and non-governmental organisations throughout the state. The state-level International Yoga Day was observed here at Paljor Stadium, which was organized by Sikkim State AYUSH and Department of Health Care, Human Services & Family Welfare. Governor Shriniwas Patil was present as the chief guest and Sikkim Legislative Assembly Deputy Speakers Sonam Gyatso Lepcha as the guest of honour. 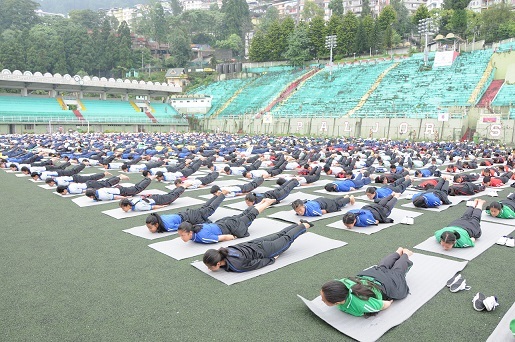 On the occasion, students from schools of in and around Gangtok participated in the demonstration of different Asanas along with participants from Sikkim Police, ITBP, Red Cross Society, Art of Living, Sant Nirankari Mission, Marwari Yuva Manch, Indian Reserve Battalions, National Service Scheme, NCC, Nehru Yuwa Kendra, Sashatra Seema Bal and Sikkim Armed Police. Yoga Asanas were performed on the direction of yoga instructor AYUSH, Jaganath Niroula. In his address, the Governor said healthy practice like yoga was an identity of the Indians and it is the duty of the people of the country to carry forward it with pride. He said yoga unites people of all castes, creed, communities and countries. He expressed his happiness that the state government had made yoga a part of the school curriculum and was convinced that a healthy programme would enhance the students’ lives. The State Health Care, Human Services & Family Welfare Minister AK Ghatani spoke on the importance and awareness on the benefits of practicing yoga.